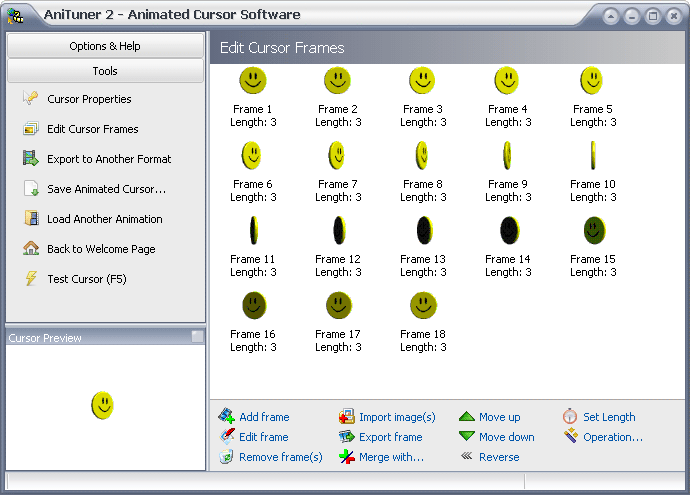 Make animated cursors from animated GIF, AVI clips, bitmap strips, or by importing existing image files (BMP, JPEG, PNG, GIF, PSD, ICO, CUR) as cursor frames. Create animated GIF, AVI clips, Adobe Flash movies, bitmap strips from animated cursors or any other image set. Resize and edit frames, set frame duration, change color depth, create 32-bit XP and Vista cursors with partial transparency (alpha channel). If you need more information please contact the developers of AniTuner (G.D.G. Software), or check out their product website.